The Pend Oreille County Economic Development Council commissioned research firms in early 2018 to perform an economic impact study of the county major industries, as well as a county-wide survey of residents to measure their opinions regarding the economic future of the county. 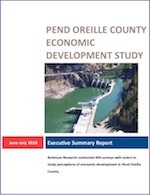 • Pend Oreille County Economic Impact Study. This study was performed by Robinson Research with Jeffrey Bell Consulting and examines data to determine the economic impacts of the Ponderay Newsprint and the Teck zinc and lead mine. - Click to read or download Economic Impact Study. • Pend Oreille County Economic Development Study. This study comprises a survey performed by Robinson Research of 400 residents, to measure public opinion on a wide range of factors that shape the county economy. - Click to read or download Powerpoint presentation. * Executive summary with comments available on request. Email us.